Yesterday the clouds were gathering in the afternoon. Started to look like it really was going to rain. I hurried to get a picture of these roses. I thought if it rains it will beat them down. Finally at 5:20 , it did start to rain. A quick and heavy rain for about 10 minutes. It did stop for a bit then rained some more. We are having the lawn treated for nimblewill and crabgrass...but there were many dry spot from lack of rain. The ground was soaking the rain right up. What do you get when it's hot and it rains....well this morning we had fog. It was much thicker when I first looked out this morning. One more rose bud, and the roses were still there...the rain did not tear them down. I did find a piece of fern in the yard, I stuck it into the little watering can I keep on the porch. I have no plans for today. I will do my regular everyday chores. I will get a birthday card in the mail , for my sister Brenda. Since I am going to the dentist first thing on Monday morning . Not much happening here and for now that is fine. We have a busy week coming up. We will have to get the driveways ready for sealing. That means trimming some of the pachysandra back for the edges. Moving some things off the front drive. Our neighbor said we can park in their farm drive for a day. That will help . They are getting their house drive done by the same crew. In my daughter Angie's neighborhood, there's three new homes being constructed. On postage stamp sized lots. Not much yard. This would be good for older people. Anyone with children will need a yard. You can get an idea of how close these homes are here. Maybe 10 to 12 feet between them. There is a very nice paved street in the housing area. But not enough for all the lots that are marked for homes. That is if you have more than two cars. If you have children, you may have 3-4 cars. Teens that is. :):) So far no one has built next to my daughter . I told her and her husband they should buy the lot to the north of them..as the fellow in the corner bought two. Then there would be some room between them. Talk about crowded....look at my mums. Some are blooming already. I thinned these out in early spring and gave some to two of my daughters. I may do that again next spring. Would you like a root canal , or a poke in the eye with a sharp stick?? I know, yikes, neither !! I am showing some pretty pictures...well because I need them , after the day I had . My dentist has finally realized my sensitivity is actually the need of a root canal. I went in on Monday. He doesn't do those, he recommends another dentist....in another town. So yesterday my appointment was for 2:45. I get the day going by watering flowers and deadheading. Rake some dry patches in the lawn to see what was up with that. Bring the trash can from the road, to the garage. Sweep the porch. Come inside and sweep the kitchen. Do breakfast dishes. Then have lunch. After lunch, I get showered and ready for my appointment. I think my eye looks red ...now this is after I rubbed my eye . I look at it again later. Thinking, maybe it's pink eye . I look it up on line. LOL. Then I call the dr. They tell me to come in soon. So I call the dentist, tell them what is happening.....they tell me to stay away. (HA) You know, as if I were covered with cooties. I go to the new young doctor . He has the nurse to get something to numb my eye for a dye check to see if I have scratched my cornea. They put drops in and the dye, check for scratches...say I have none and that they do not think it's pink eye...no matting, itching, or watering. Young doctor say you should go see your "eye" doctor. ( DOH) So off I go to the eye doctor. He says no scratches and he didn't think it was pink eye either. Orders eye drops. By now my eye is beet red and irritated....plus dilated. I go to CVS for eye drops..
Come home, reschedule root canal. Use eye drops. Hours later my eye is still dilated. So I call eye dr. they say call young dr. I call they are done for the day. I call eye dr. again, just to get a general idea of how long my eye will be dilated. They say hours, maybe days. DAYS !!! I get up in the middle of the night and check my eye...it's a bit swollen, red also. This morning. It's red and I use the drops and it feels better but red and still dilated. Remember when I went to the zoo on Saturday, here's some left-over shots. Have to use them up, since I haven't been doing anything exciting since. LOL. Here' some wallabies. The one behind the rock had a baby. ..so cute, but she was not going to show it off just yet. Fancy chickens ...such pretty colors. They were doing some crowing too. I would too if I looked as pretty as the one with yellow.Wow. A totem pole beside the eagles pen. That area did not smell good on such a hot day. My daughter Karen is trying to get some goat feed. But the goats know that sound and where the food is so they will run you over. I had to laugh, Karen said the one had his face right in the shoot where the feed comes out. So funny. This is a sculpture area. It once was a real slide...now it has things welded to it and this cute dino skeleton. Sweet Savannah had caught a monarch butterfly. I have not been seeing any monarch in our area here in Tipton. I hope others are seeing them. In the little train riding around the park you get to see colorful animals. You know the young kids just love this. This was just a couple of the animals. I would love to go back when the temperature are much cooler. There so much to see in this small park/zoo. Today my sister Pam and I met up with my daughter Karen and granddaughter Savannah. We went back to the little zoo in Lafayette, Indiana. Pam had never been. It was a hot humid day. We had bottles of water iced down in the car. We got there in time to see the" snakes alive " show. This is the 40 pound 8'6" boa constrictor. Remember his name is Julius Squeezer. I want to hold him so badly. They only let us touch a rat snake and it was a skinny baby one. I thought this was a cute sign. Julius was very shiny and so pretty. He seemed to like his tree. The young girls who tended to the snakes told us more about them. The boa will continue to grow, up to 16 feet in length. This is my sister pam, we are going into the butterfly area. So many gorgeous flowers all over the zoo property. It was extremely hot in the butterfly exhibit. So hot that I took some quick shot and did not ask about what kind of butterflies there where . The girl at the door did say they change regularly. Lots of butterfly bushes and flowers, plus a water feature for them. This is the train depot. We did get on board the little train and ride around the park a good ways. Got to see the ponds with the big water fountain. There were lots of ducks and geese. None in this shot. It was a very hot day but we truly had a fun time and enjoyed it all. Went to lunch and ate a great meal. Then it was time to come home and call it a day. I don't mind saying I am very tired....I am sure it was the heat. So I am not doing anything more today. These are pictures from the Horton's emporium/hardware store. :):) Nice cow head, wish I had touched this to get a sense of the material. It looks metal. Hey, I am no farmer...this looks like a sheep head to me. I used to tell the fellows I worked with, that I want to be outstanding in my field, but I did not want to be a farmer. That's an electrician's job. Lots of tea towels and signs. Notice the tarnished trays? I need to get busy junking to get myself some of those. If I don't get myself some silver polish soon, all my good trays will be tarnished. I like this metal cutout shaped like the states. Little magnetic hearts to hold notes and such. More tea towels with farm animals on them. One is a chicken ,on a pig, on a cow...why? LOL..I truly do not know the meaning of this...do any of you ? Do many of you keep journals?? I have journals for just about everything in this house. They are not always up to date...so occasionally I have to up-date information. Like my medical journal. I have given journals for graduation gifts and informed the recipient that they must keep a medical journal...cause the doctors and hospitals want to know everything. I keep a house journal, the lawn, dri-gas fills, appliances, repairs , and purchases are recorded in it. The golf cart, truck repairs also. The water system filter changes, are recorded. Here's where coffee comes in. Do some of you drink from a dainty cup such as this one? 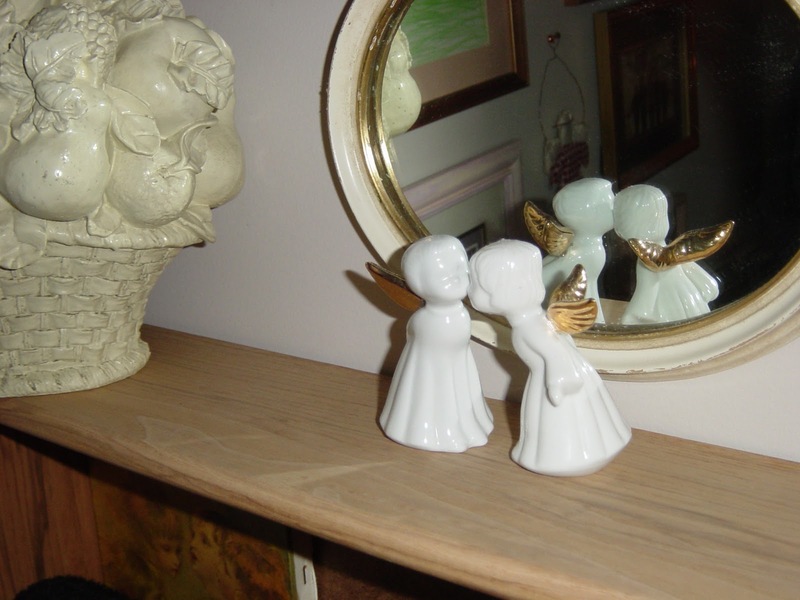 A pair of angels in memory of my brother and his wife. It is hard to believe they has been gone from us for 17 years. We all still miss them. My brother Miles and sister-in-law Brenda were high school sweethearts. Always together . Still together. Miles was a detective for the Indiana State police for 26 years. Brenda worked the dispatch for the sheriff's department. They had two children. Miles and Brenda had been married 30 years at the time of their deaths. A young man ran a stop sign, clipped a semi truck and the truck struck my brothers car. They did not suffer, thankful for God's mercy. Not wanting to make anyone sad or uneasy, I just miss them.